I hope you had a beautiful Easter, filled with family and fun. I know we did. We had a houseful on Saturday - family and friends, young and old. What a blessing! Then on Sunday we went to church with one of of sons and his family. Sunday turned out even better than Saturday!! 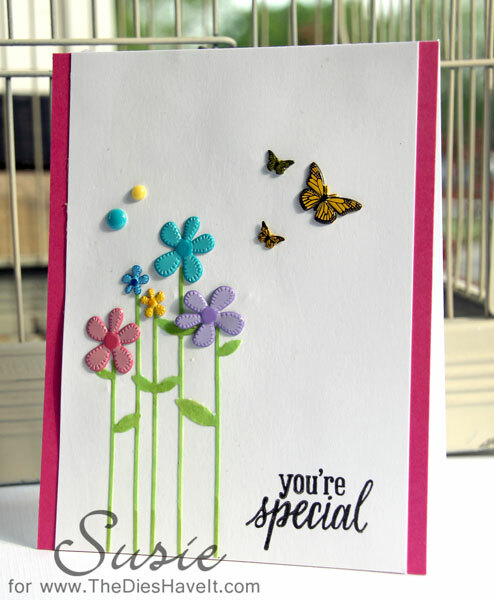 The weekend's happiness is spilling over into Monday and so I bring you a cheerful card. The stars of the show are the flowers and butterflies from Eyelet Outlet. I just love the stitching on those flowers! I hope you have have a marvelous day and I'll see you right back here tomorrow.